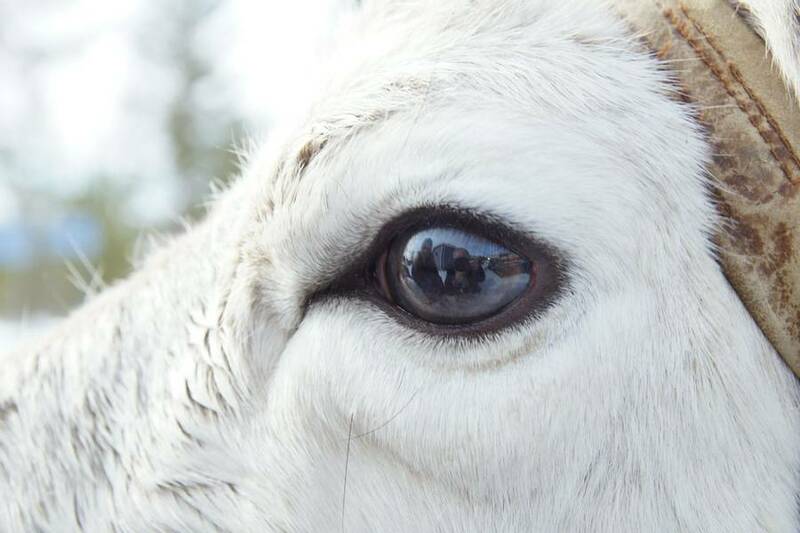 I’ve been lucky enough to visit several reindeer farms in Finland, but Salla is my favourite. 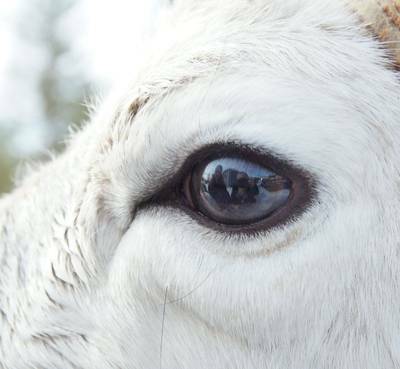 Stepping into the corral, the reindeer herder sprinkled a circle of feed around my feet and straight away the reindeer trotted towards me and started snuffling away, chomping at the food. Being that close to them was a fantastic experience and I felt very lucky indeed. It’s an incredible place to visit. Deep in the snowy wilderness of Finnish Lapland, just north of the Arctic Circle and close to the sparsely populated Russian border, Salla is the ideal location for a weekend of Northern Lights hunting. Direct flights, cosy winter cottages, endless pristine nature and a fantastic ski centre make it the perfect all-round package for those looking to combine Aurora hunting with thrilling winter activities. We are experts in our field and the Northern Lights are our passion, which is why we continually strive to pick the best destinations with the best activities and the ideal opportunities to search for the Aurora. Your time is precious and so we’ve created this weekend itinerary which makes use of the recently introduced direct flights between Gatwick and Rovaniemi. We’ve been waiting for just this sort of opportunity to present a new and exciting weekend of adventure in Salla. 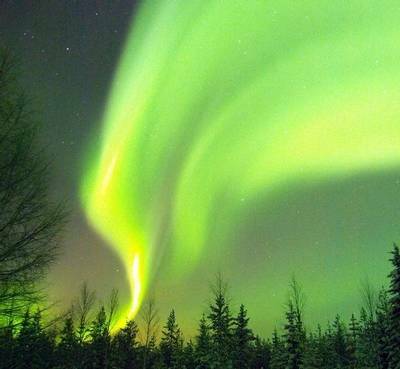 We’ve included two nights of Aurora hunting, via snowshoe and reindeer-pulled sleigh, to maximise your chances of seeing the Northern Lights in an area renowned for its dark skies. 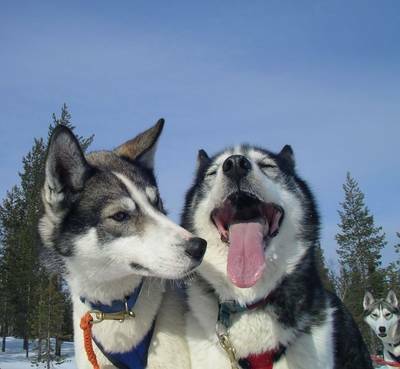 You’ll also take part in a thrilling husky safari through the snowy forest so that you can enjoy one of winter’s iconic experiences. 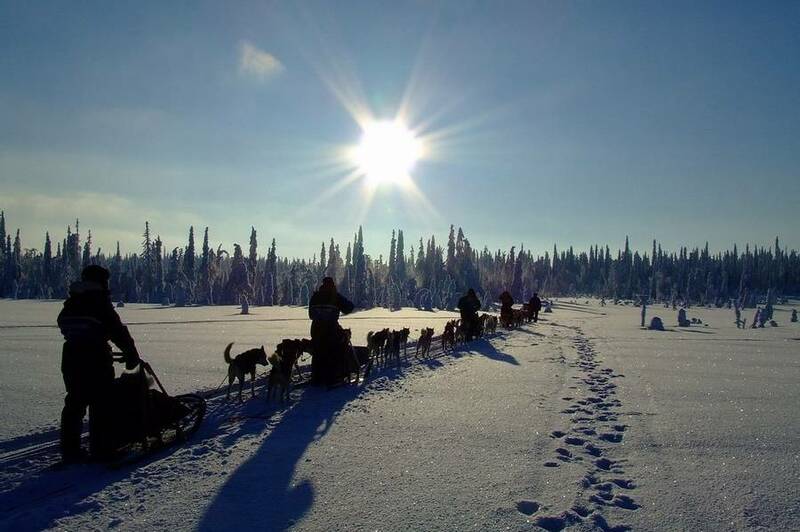 Arriving in Lapland in the late morning, you’ll transfer to Salla, driving deep into the Arctic wilderness, past snow-covered forests, frozen lakes and rolling fells, all of which add to the growing anticipation for the weekend. 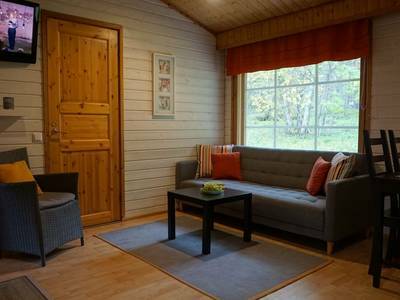 The afternoon arrival in Salla will give you plenty of time to settle in and explore the local area so that you can make the most of your weekend Aurora getaway. 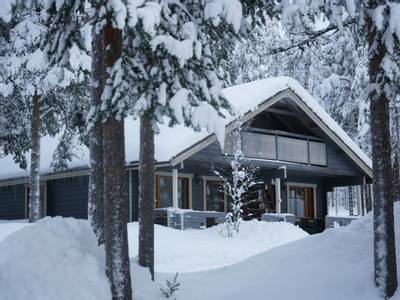 During your three nights of Arctic adventure, you’ll stay in a cosy winter cottage, in amongst the trees and within walking distance of the main restaurant and ski slopes. We’ve made sure to include one free day during your weekend break so that you can tailor your time as you like. Why not make the most of the nearby slopes and enjoy carving down the pistes in an area made famous for the discovery of the world’s oldest ski (3200 BC)? 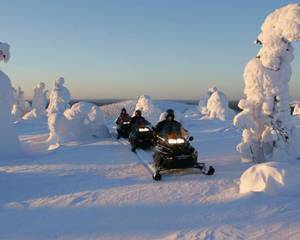 For those feeling more adventurous, you can also add on an action-packed snowmobile safari to the Russian border to experience the stunning, unending wilderness. Alternatively, a day snowshoeing in the fells provides you with enough photo opportunities to fill your memory cards several times over…so remember to take some spares! An early start will see you arrive in Finnish Lapland late this morning at Rovaniemi Airport. From here, you’ll meet your local driver who will transfer* you to Salla, which is around two hours away. The beauty of arriving during the day is that you can sit back and enjoy your transfer, watching the winter scenery unfold as you make your way north of the Arctic Circle. Twisting and turning through the fells and forests, blankets of glistening, white snow cover the hills and branches, creating a winter landscape the like of which you may have only ever seen on a Christmas card. Arriving at Salla, you can check in at the reception and collect your winter clothes. Your cottage will be available in the late afternoon (or earlier, but you can leave all of your bags at reception whilst you explore). The cottages are only a short walk away from the main building. 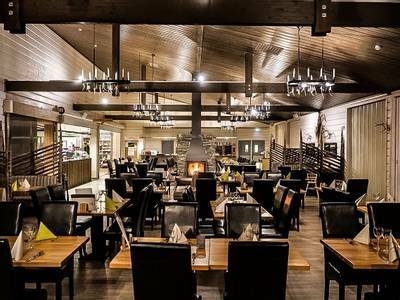 For lunch today, we recommend the nearby Kelot log restaurant, which sits close to the ski slopes and within easy reach of your cottage. It serves good, traditional food in a relaxing and friendly atmosphere and it is a great place to get your bearings and look forward to the weekend ahead. 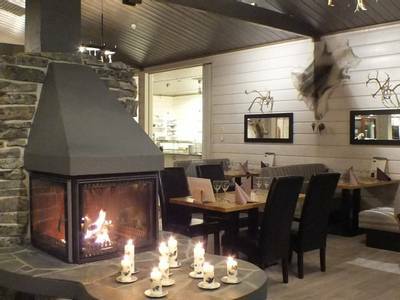 Salla is a small village, but this afternoon gives you the perfect opportunity to explore the area before enjoying your dinner in the restaurant tonight. *Arrivals and departures which don’t meet the group transfer times will be subject to a private transfer supplement. 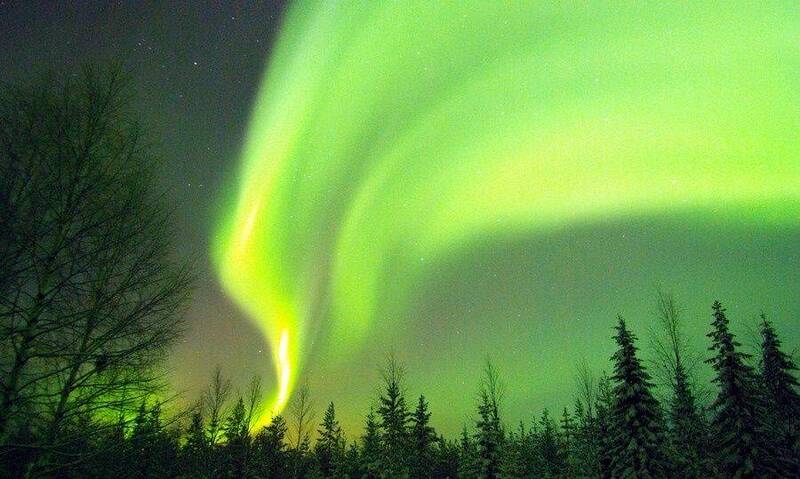 Remember to look to the skies this evening, in case the Aurora decides to make an appearance. Today has been left free for you to tailor your time as you like. 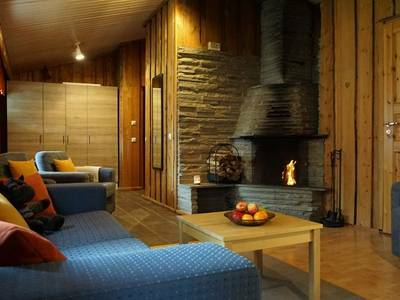 After a hearty breakfast in the restaurant, why not head to the nearby ski slopes and enjoy a day on the pistes? 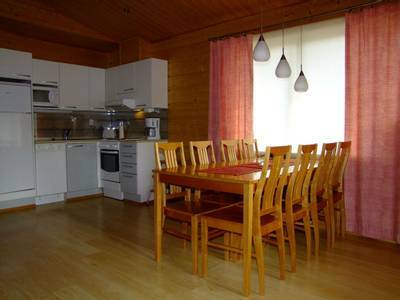 With a professional ski school and fully-equipped rental shop, your every need is catered for here, so whether you’re a seasoned skier or a budding enthusiast, you can be sure to find something to suit your level. All skiing arrangements can be booked locally, the pistes aren’t exactly overcrowded! If you’re looking to add some more adventure to your time away, you could take part in a thrilling snowmobile safari to the Russian border. This full-day trip is not for the faint-hearted, but it does offer you the chance to travel into the stunning borderlands. Alternatively, you can spend a day snowshoeing in the fells with photo opportunities aplenty. Please see our ‘Personalise’ section for full details of the extra activities available. This evening, you will have an early dinner prior to tonight’s Northern Lights snowshoe adventure. 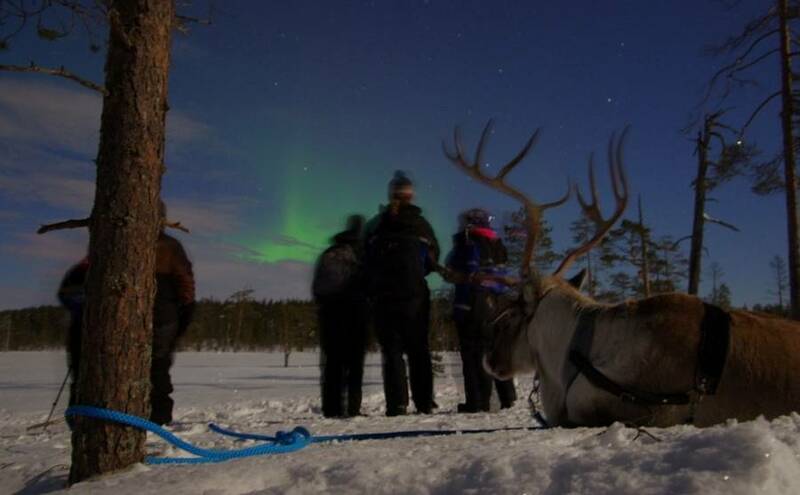 Starting at approximately 6 pm, you will transfer to the nearby reindeer park for an evening of Aurora hunting in the wilderness. Out here, the dark skies and minimal light pollution create the perfect setting for starry skies and potential Northern Lights displays, which is why we have included two Aurora hunts in this weekend break. Strapping on your snowshoes, your knowledgeable guide will lead the way through the wilderness as you look to the heavens in search of a display. You’ll stop for hot drinks and a rest, before heading back through the forest. 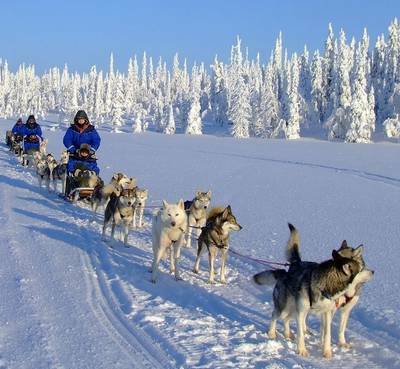 Today is the main event: a husky safari through the snow-covered countryside, followed by a Northern Lights reindeer safari. After breakfast this morning, you will be transferred back to the reindeer park. 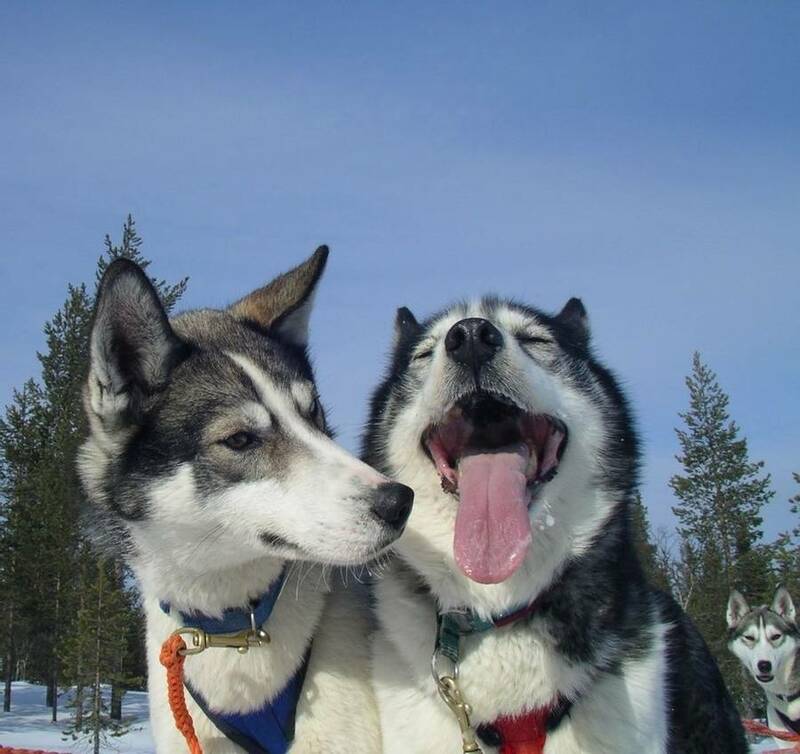 Then, following a full safety briefing, your expert guide will take you to meet the dogs, who will be barking with enthusiasm and itching to get onto the trail. As you walk towards your team, a surge of excitement will rush through you in anticipation of the thrills ahead. If you like, you can even help the guide to harness your team. Although the dogs will be barking as loud as they can, once you’re on the trail, they’ll fall into a silent state of pure focus (and intense happiness! 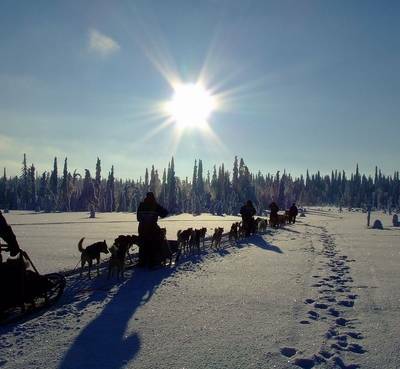 ), effortlessly pulling you along as they follow the snow-covered tracks through the frozen landscape. 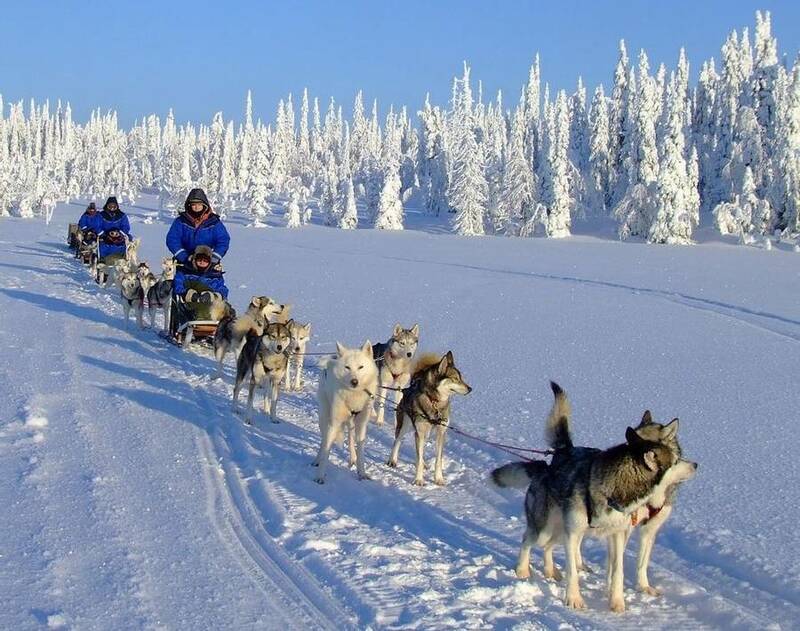 It’s one of the most fulfilling Arctic activities you can do in Lapland, which is why we’ve made sure to include it in your weekend break. During the safari, you will stop in the forest and your guide will cook lunch over an open fire. After your meal, you’ll have the chance to swap drivers and passengers before continuing. The safari will last for around four hours in total. Returning to your cottage, you will have the rest of the afternoon free before eating an early dinner prior to tonight’s Northern Lights reindeer adventure. 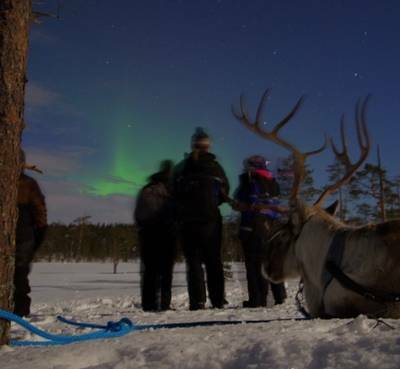 Starting at approximately 6 pm, you will take the short journey back to the reindeer park for an evening of Aurora hunting. Setting off from the park, you will be pulled by your own personal reindeer, travelling one person per sleigh. Each sleigh is tied together, so you don’t need to worry about guidance, you can just sit back and enjoy the ride. Travelling by reindeer is a fun and relaxing experience and as they pull you along the snowy trail, you’ll hear the occasional grunt and snort punctuating the silence. When your sleigh comes to a stop, it’s not uncommon for the reindeer behind you to rest its head next to yours, so you may end up with one extra friend tonight! During this six-kilometre safari, you’ll stop at a reindeer corral where you will have the chance to feed the females and calves in their pen. They love nothing more than snacking away on moss and lichen, so grab yourself a handful and start feeding; it’s a great chance to get up close to Lapland’s iconic animals. 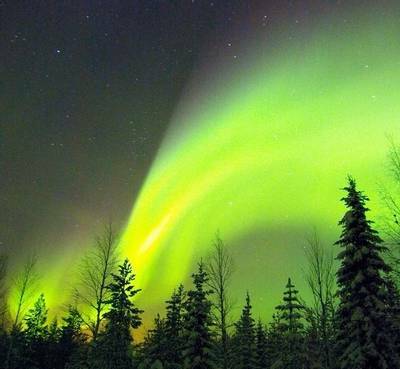 After this, you will stop deep in the forest at an ideal Aurora viewing location where your guides will make a fire and you can enjoy a hot chocolate or berry juice. This is always a favourite highlight of any trip to Salla, with the atmospheric location sparking feelings of excitement and intrigue as you hear stories about the Northern Lights and learn about the area and its history; from ancient skiing to the Second World War, it may be remote but it’s not lacking in Arctic heritage. Following your night of discovery, you will head back to your winter cottage. 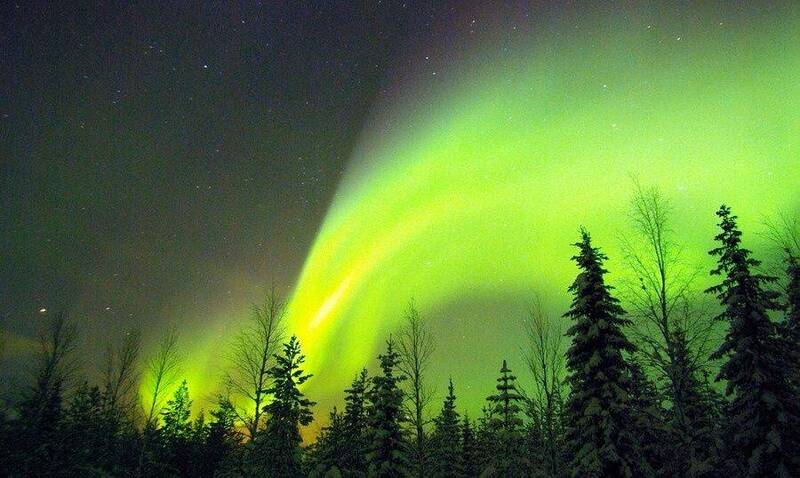 Keep your eyes peeled though, as you might catch a glimpse of the Aurora before you turn in for the night! 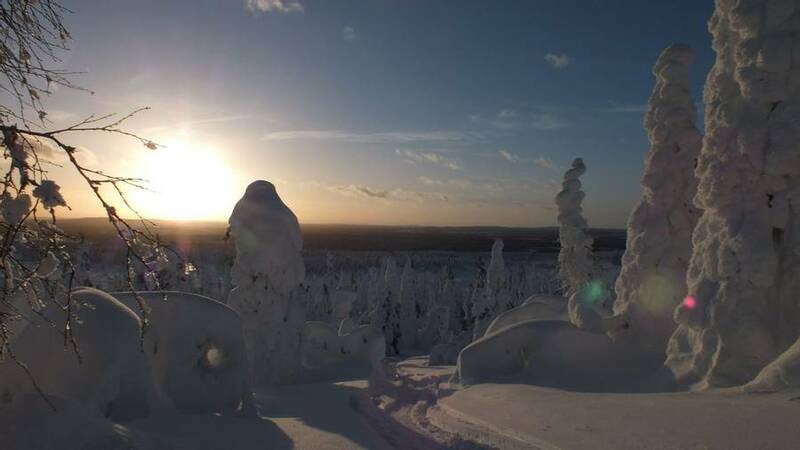 Sadly the time has come for you to say goodbye to Finnish Lapland. After a breakfast this morning, you will be transferred to the airport for your fight home. 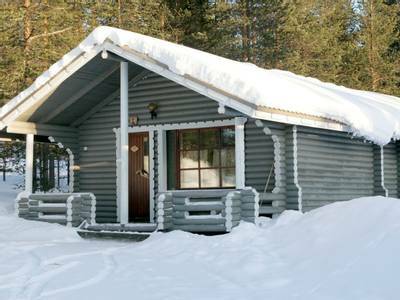 Owned and operated by a local family, Salla offers a variety of winter cottage accommodation nestled in the woods and all within walking distance of the various amenities within this small village. 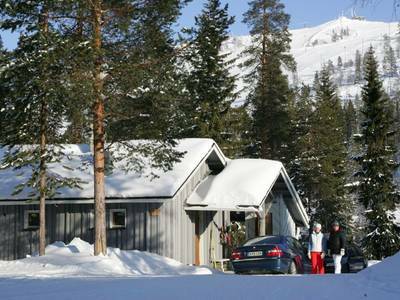 The beauty of Salla is that everything is within easy reach, so for those looking to combine fantastic winter activities, incredible wilderness, traditional wooden winter cottages and even some downhill skiing, this is the place to be. The winter cottages are traditionally designed, providing a warm and cosy base for your stay and the nearby restaurant and pub are perfect for fuelling up for your adventures or relaxing in the evening. 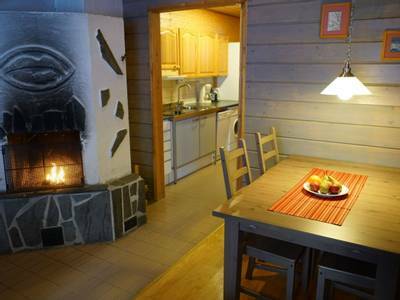 These one bedroom winter cottages are only a short walk away from the reception and restaurant, as well as being close to the ski slopes and surrounding amenities. 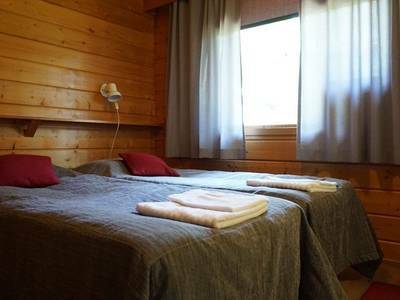 Decorated in a traditional style, each cottage has twin beds which can be pushed together, as well as a shower room with toilet, kitchenette, coffee maker, fridge, washing machine, clothes drying cabinet, TV, radio, telephone and free Wi-Fi. An extra sofa bed can be accommodated in the lounge area. 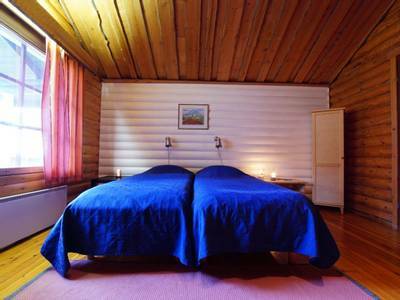 If you would like the added bonus of your own private sauna, then these are the cottages for you. 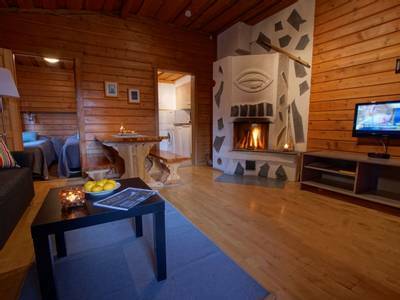 Each one is equipped with the same facilities as the standard 25m² winter cottage, except you have the added luxury of a sauna and fireplace. An extra bed can be accommodated in the lounge area and four of these cottages also have a loft space which can fit an extra bed. Firewood is provided for the duration of your stay. Please note that the images shown are from the 34m² and 42m²cabins collectively. For larger parties, there are several two and three bedroom cottages available. 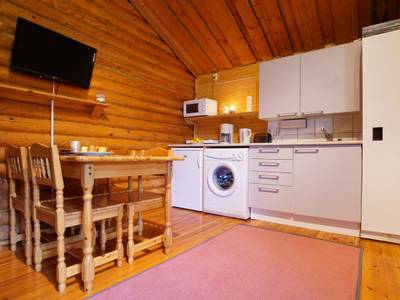 These cottages also have their own private sauna and fireplace (firewood included), as well as a kitchenette, shower and toilet, coffee maker, washing machine, clothes drying cabinet, TV and radio. 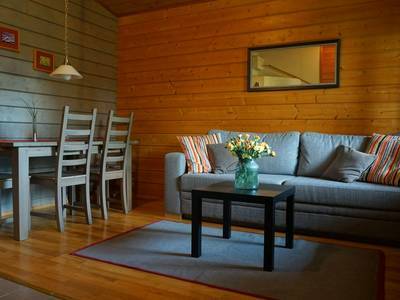 Free Wi-Fi is available in some of the cabins. Extra bed space is available. 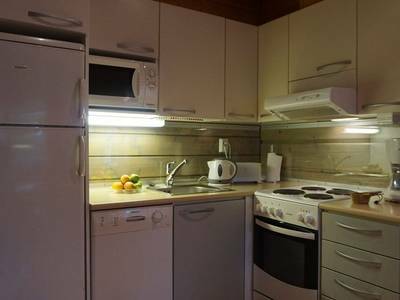 Please note that the images shown are from a variety of two and three bedroom cottages. If you’re looking for an adrenaline-filled day of fun and adventure, then this is the activity for you. Your expert guide will lead you on a snowmobile safari deep into the wilderness close to the Russian border. This 60km safari is a full day, strenuous activity, which will last for 5-6 hours. You’ll pass through the breathtaking winter scenery of snow-covered forests and fells, over the thick, thick ice of the frozen lakes and into the stunning borderlands. You will drive two persons per snowmobile with several chances to swap drivers. Drivers must be 18 or over and hold a full and valid driving licence. This safari starts at 10 am and finishes at approximately 3-4pm. Lunch is included. The activity is only available on Saturday, which means that you will then start your Northern Lights snowshoe trip at 6 pm. 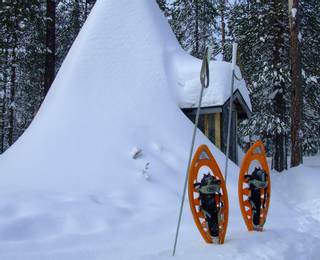 Transported in a snowmobile-pulled sleigh, you’ll travel to the base of the Ruuhitunturi fell where you will start your journey through the forest and to the top of the fell. Your knowledgeable guide will lead you up the fell where there is often more snow than in the surrounding area and photo opportunities are around every corner. 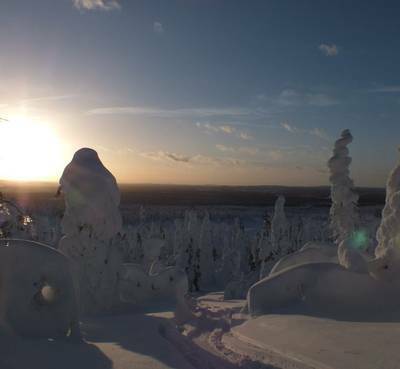 At the top of the fell, you’ll be treated to a fantastic view of the wilderness that surrounds Salla. A picnic with hot berry juice will be served before you head back down. The snowshoeing can be strenuous at times, but your guide will make plenty of stops to meet the group’s abilities. You will hike for approximately 3 to 4 kilometres. Most of our holidays require a minimum number of participants to operate. Minimum numbers are detailed on each holiday page and are always approximate. Group sizes for tailor made holidays will vary for each of the activities. For private departures you may also be joined by other guests during the activities unless you have discussed specific private activities with us. If your selected date has not yet reached minimum numbers you will be informed at the time of booking. In the unlikely event that your chosen date has not reached the required minimum numbers nine weeks before your scheduled departure date we will contact you and discuss the various options available to you. We will always do all we can to operate a holiday and in some cases we may be able to operate the holiday by combining your itinerary with that of other guests for some activities (this may mean that the maximum group size is increased but this will be discussed in full with you). If we are unable to operate the holiday then you will be offered the chance to transfer to an alternative holiday or date (subject to availability). If the alternative is more expensive you will be asked to pay the difference, if it is cheaper then you will be reimbursed. You will also be offered the option to cancel and receive a full refund of all monies paid. If you or any member of your party is pregnant or has any medical condition or disability which may affect your holiday or has any special requirements as a result of any medical condition or disability (including any which affect the booking process), please tell us before you confirm your booking so that we can assist you in considering the suitability of the arrangements and/or making the booking. In any event, you must give us full details in writing at the time of booking and whenever any change in the condition or disability occurs. You must also promptly advise us if you become pregnant or any medical condition or disability which may affect your holiday develops after your booking has been confirmed. We offer a vast choice of holidays which range from 'relaxed' to 'active' so there really is something for everyone and our holidays can be filtered by how active they are. Regardless of the chosen holiday, all activities will include tuition from a beginner's lever and no prior experience is assumed. In almost all of our destinations you can book and pay for additional activities locally. Please note that we cannot be held responsible for any injury or loss that occurs through any activities that are booked in your destination (see our terms and conditions for further details). Please always ensure that your safety is your primary concern when arranging any such activity.